The existing house, shown in black wash, is five bays on a rectangular plan with two chimneys at either end. The entrance vestibule leads directly into the geometric staircase, ante-chamber, withdrawing room and eating room. The eating room has a segmental end and columns framing a recess on the north wall. The proposed east wing has a breakfast room, a library, and a circular single-storey top-lit 'room for pictures, statues, etc' that is round in plan and 30 feet in diameter. A staircase leads down to the basement. 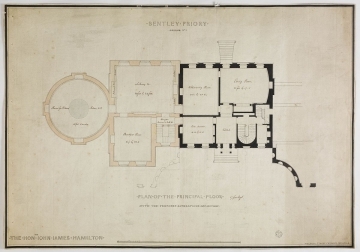 The rooms on the ground floor are aligned with the existing house so as to establish a vista from the entrance hall through the drawing room and library.